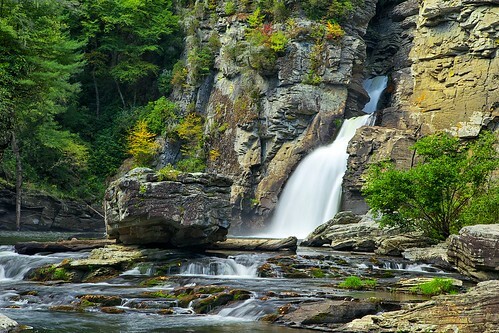 Most people who visit Linville Falls never see the falls from the bottom at the plunge basin. For me, the view is not very impressive at the overlooks. I prefer to get up close with my waterfalls! This image can be purhased HERE. 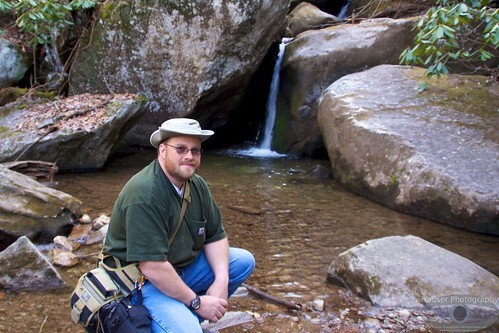 On my first outing with the CNPA, we visited four waterfalls in and around McDowell County. 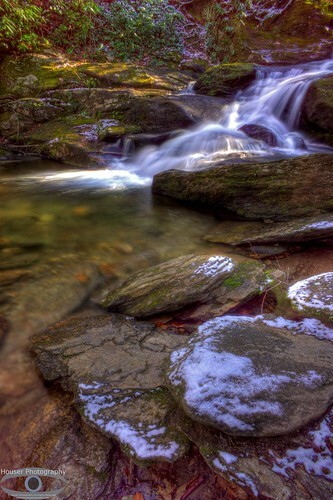 I really liked Roaring Fork Falls near Busick, NC and I wanted to try and shoot Tom's Creek Falls again. Since I was off from work it was easy to just go! 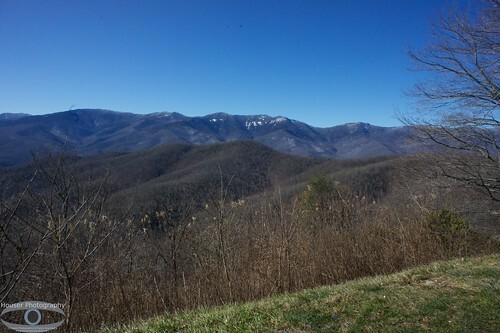 As I made my way from Morganton to Marion, I noticed that at the higher elevations there was a coating of snow on the high peaks to the West. 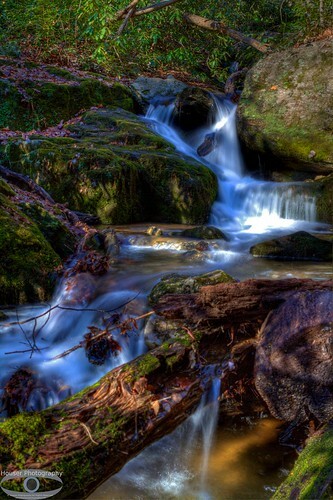 I shot almost everything HDR this trip but even HDR would not help me with the lighting situation at Tom Creek Falls as the Sun just was not helping things. The water flow was nice and I have yet to give up on this waterfall, but I think I will wait until Spring before I try it again. Exploring Tom's Creek below the waterfall, yielded this nice little cascade. I really like the way the water runs through the log! 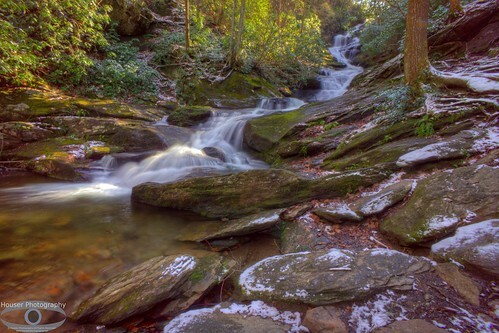 Roaring Fork Falls was a little higher in elevation and there was still a few patches of snow left on the rocks. Just some slush. Last trip it was my favorite waterfall and it did not disapoint! I wish I had visitied this falls first but it turned out decent! Just zoomed in a little tighter. 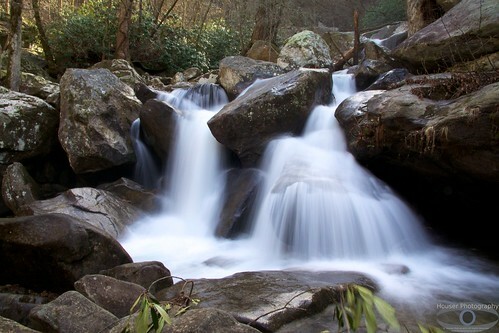 As I was coming up to Roaring Fork Falls on NC 80 I passed under the Blue Ridge Parkway, so after shooting Roaring Fork, I decided to get on the Parkway and maybe score some nice shots from the overlooks. 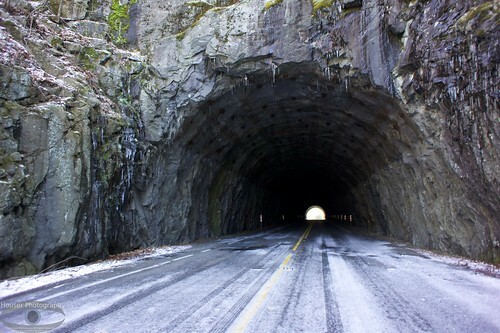 The BRP was mostly clear with some slush in some spots but perfectly driveable... that was until I reached this tunnel at Little Switzerland. On this side it was slushy, on the other side it was a SOLID SHEET of ICE! 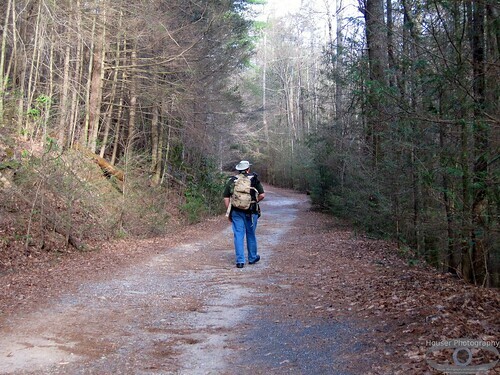 I was happy I made it to the next exit at the Mineral Museum and rerouted to Spruce Pine, to Linville Falls and back to Morganton. So much for 2WD! 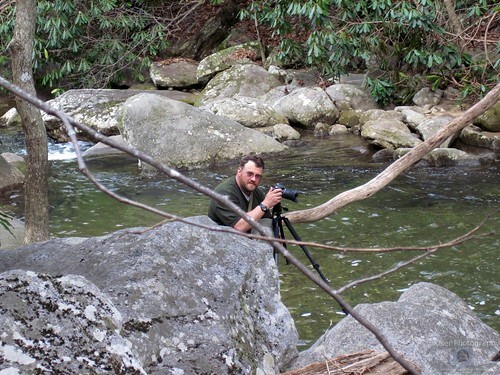 Hunting The Ever Elusive Perfect Waterfall Shot! My Wife thinks I have a one track mind and she is correct. Once I try something I am not happy with the outcome unless it gets close to perfect as possible. That is why I had to hike back up to High Shoals Falls three times, as I was unhappy with the first shots and wanted to try them again. I think I nailed how to get that silky/blurred moving water effect but the light was all wrong. I still think I could do better, but I am happy with what I got. Some people wonder what kind of gear I carry and a bunch of it is based on the Boy Scout Mantra, "BE PREPARED". 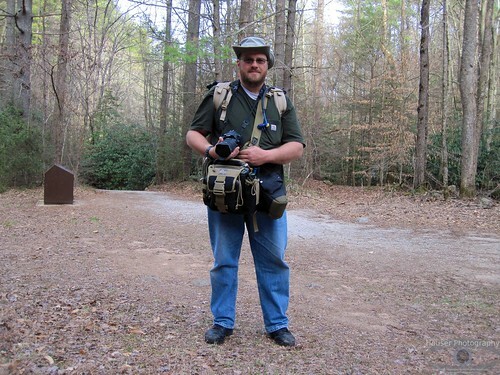 That be prepared applies to camera gear as well as basic wilderness gear. 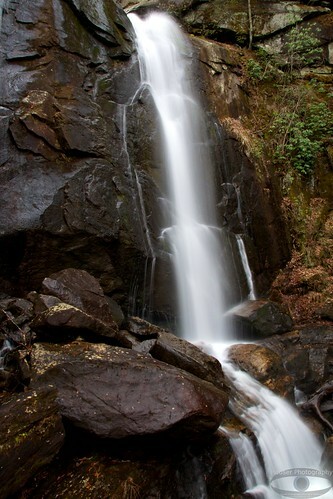 For waterfalls you really get great shots if you use Neutral Density filters. They basically act like sunglasses for your camera, which allows you to keep your shutter open longer to get that beautiful blurred water without over exposing the scene. For shooting those longer exposures, sometimes as long as 2 seconds, you need a stable platform to keep your camera still, so a tripod is a must. I also use a delay to prevent camera shake. I also carry extra batteries as well a spare lens and a point & shoot. I carry my extra camera gear in my Maxpedition Versipak shoulder/hip bag and it gives me a safe place to hold my lenses and filters as I swap them out. Nice to have with you! I also carry my Spec-Ops Brand backpack that I can lash on my tripod and carry 3 liters of water in a hydration bladder. I also have my first aid kit, snacks, water purification system, rain gear and survival kit in case I have to stay put for whatever reason. 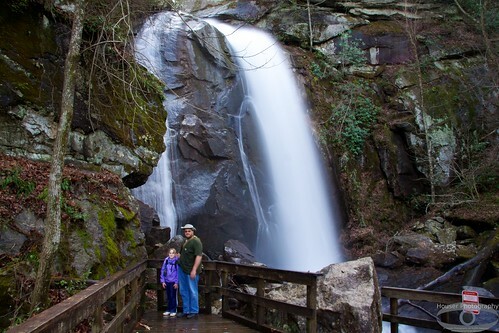 ... this one of my Daughter and I standing at High Shoals Falls, to me, is priceless!